Recently I was asked by a friend, fellow writer Clark Knowles to participate in an interview excercise. He would send me 10 questions about my next book if I'd post the answers to my blog, then pass the questions on to another writer. The questions and my answers are below. This is the first time I am disclosing specific information about my next book. I think the seed of the idea germinated while I was reading James Fennimore Cooper’s The Deerslayer. I have always been fascinated and in love with Native American culture, history and myth, and especially how that culture was changed by the incursion of the Europeans. After I read Deerslayer I began to wonder why there aren’t more books like this, books about the frontier that respect native culture, books that a boy like I was could fall in love with. I began to think about Indians and asking them to appear to me in some way that I could understand so that maybe a story would emerge. And it did. Probably literary fiction, but perhaps young adult. I was thinking about writing a YA novel from the get go. I prefer not to color the reader’s (or my own) portraits of my characters ahead of time by associating them with famous faces. I like to keep my characters blurry. With just an old family bible to guide him, a white boy raised by Sioux Indians embarks upon a quest to find his origins and discover his name across Wyoming, Nebraska and Kansas in 1872. The first draft took about fourteen months. But I had already written the first 1000 words on Twitter as a writing exercise and there was a gap of almost a year between that and the actual long-hand draft. I think the book that comes closest is Cormac McCarthy’s The Crossing. Part of the inspiration came from my dear friend Andrew Wilson, a writer, who, upon reading a few pages said “It’s Cormac McCarthy for boys. That’s what I’m going for. But The Earth is all that Lasts is a classic hero’s quest in the mold of Joseph Campbell. So in that way I could compare the book to hundreds of such stories from The Odyssey to Cold Mountain. Well, a big part of it was Fennimore-Cooper. I love his Natty Bumpo, his transformation to Deerslayer and then to Hawkeye. My main character, the young scout Hawthorn, was created very much with Hawkeye in mind. In fact, until I wrote that last sentence I never saw the phonetic connection between the two names. Fascinating. The subconscious mind is amazing. All these things swirl and swirl and some of them coalesce. It’s like making planets from stars. Hawthorn, though genetically white, is spiritually an Indian. His Sioux father is a great warrior and holy man called Old Rainbow who raised Hawthorn as his own son, with no prejudice. Hawthorn is not just an accomplished warrior, he’s also a Wolf Dreamer, which is a sort of prophet and a very exalted role in the tribe. 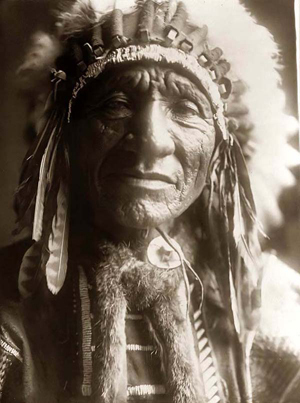 A central theme is identity of course, but at the core of story is a struggle between two world views – that of Manifest Destiny and the subjugation that that entails and the ecological humility harmony represented by Native cultures. All this is set against the backdrop of a post-Civil War America. So it’s historical and there are elements of a Western, but it’s also a story about the meaning of family. Stamped steel, cured rubber, wireless communication and the wonder of flight. Modern miracles all. New centuries give birth to new magic. Technology, the code word for faster, cheaper, closer together. Technology draws us nearer, it pulls us in. It homogenizes and flattens. The illusion and safety of distances fade. Words and bodies now hurled through the very ether itself. What was once invisible, unreachable, becomes more convenient and clear. We see this as progress. We see this as good. No longer Earth-bound, no longer needing to shout to be heard. Our voices and our bodies are everywhere at once. We permeate the Earth with our shadows and sounds. It is 1923 when the man builds his first coaster wagon. Initially they are constructed entirely of wood. By 1930 he transitions to steel and renames his creation in honor of the great wonder technologies of the day. People are now speaking to each other across oceans. Men are soaring ever further in their winged machines. Automobiles, no longer a curiosity, have almost become a necessary appliance. Speeding, speeding, speeding. Words and the mouths that voice them, untethered from their mortal moorings. It seems there is nothing we cannot conquer, cure, solve, do better. It is in this age that the Radio Flyer is born. Antonio Pasin. The son of a Venetian cabinet-maker. He passes through Ellis Island at the age of sixteen. He builds his first wagon out of wood but he sees the future, he takes risks. In him there burns a dream we now call American, but such vision, such desire is innately human and lies not within the province of any one nation. You cannot find a dream on a map. He is an immigrant, who brings with him the latent passions and living craft of the thriving city-states whose merchants once ruled the world. If there is a definition of America it is this. The strength and intellect of the world condensed. Germans, Irish, Chinese, Poles. Africans. Mexicans. Italians. Strength, strength, strength. These are the lifters, the pullers, the haulers, the assemblers of machines. And dreamers all. Inventors. Minds mined. Minds collected. An amalgam of hope and determination. 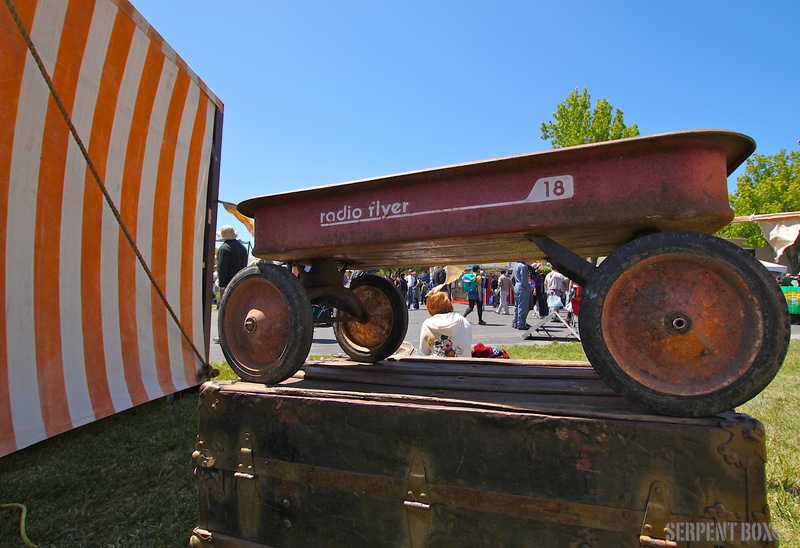 Look closely at the image above, at the rusted Radio Flyer number 18. It sits perched upon a trunk that is also an emblem of a bygone era. A chest filled with dreams. To the left are the orange and white stripes of a canvas circus tent (What marvels lie within? What wonders?). And then, below the belly of the little red wagon, a woman sits, resting. Upon her back is an image of Mickey Mouse, the symbol of the world's greatest media empire and of a man named Walt who was himself the son of immigrants, who was himself a man of vision and dreams. Mickey Mouse came to life at about the same time of Antonio Pasin's Radio Flyer. His first incarnation, Steamboat Willie, also named after what was once a marvel of modern technology. So many layers to peel back. The photograph was taken at the Maker's Fair - which is itself an homage to handcrafted magic. The Radio Flyer is a vehicle for dreams. It is at once car, rocket, speedboat, plane. It is a designed for children to sit in. It can be pushed or pulled. It rolls on rubber tires. It is as patient as a dog and sturdy as a tank. During the Depression the factory was churning out 1500 of them a day. During the Depression. The Radio Flyer is a singular marvel of simplicity. It is an emblem of youth. Every American has sat in one. Every American knows the sound it makes when it is pulled along the sidewalk with its wonky steering and squeaky wheels. The Radio Flyer is an American icon built by an immigrant who, upon seeing the Statue of Liberty, was so inspired, so moved, that he named his first creation in honor of the moment. He called his first wooden wagon the Liberty Coaster. Imagine that for a moment. Coasting in liberty. Consider the humble red wagon. The workhorse machine for so many children's imaginations. The means of their first locomotion, their first taste of the freedom of driving. Speed. Wind. The sensation of gravity. How good that feels, how terrifying. That first rush of endorphins. The wagon, which was the training vehicle for the bicycle which was the training vehicle for the car. Such a simple invention. It's basically a roasting pan mounted on wheels. Can you feel it wobble? Can you hear that sound? That is the collected voice of an entire generation of dreamers. Men and women and who risked it all, who went all in on a dream. And to think, now we want to wall ourselves in and keep them out. Because we have forgotten who we are. Iron can be heated and poured, molten, into molds of almost any conceivable shape. For the better part of a century objects created in foundries and pieced together by human hands dominated our lives. Iron was the medium of the industrial revolution but wood was it's fuel. The world was conquered with iron and fire. Trees were the first victims of the holocaust that ensued. The hunger for dried tree flesh was rivaled only by the madness for metal. First, sharpened metal in the form of edged weaponry, then metal slugs and metal jackets - high speed projectiles and the containers of fire. He who had the most metal won most disputes and though there were other factors, it's always come down to he who wields the most fire, the best fire, the most spectacularly accurate fire. If Prometheus only knew. All of history seems predicated on the refinement of fire delivery and containment. Burning is the epitome of violence and the father of it. We burn to extract and forge and shape and hurl. To move things fast you need to burn something somewhere along the line. Fire is our god; or not. But fire is the king. He keeps his subjects safe and warm. An object, made from fire and iron, becomes a container for a smaller and more controlled fire, a personal fire, a pet fire, a fire that eats trees and heats soup. A stove is a fire box and this one, the Victoria, wastes away now in a cabin in rural Georgia. To contain heat, to direct it and disperse it evenly, is a principle that has given us much in the way of comfort and convenience. But those benefits are short-lived; and short-sighted. We now understand better the value of trees, and the harmful effects of smoke. This stove, therefore, is a symbol of arrogance and greed. It is represents consumerism, the disposable society and a transition in lifestyle. If we're no longer tied to the land, why would we expect people to care for it? This is just a stove. The women who worked here were only trying to live better lives, more productive lives - easier lives. They burned wood because there was an endless supply of it and burning wood was all they ever knew or could foresee. Someone once was very proud to stand before this stove. Someone thought it was beautiful. This stove saved some woman from a life of perpetual toil above an outdoor pit. 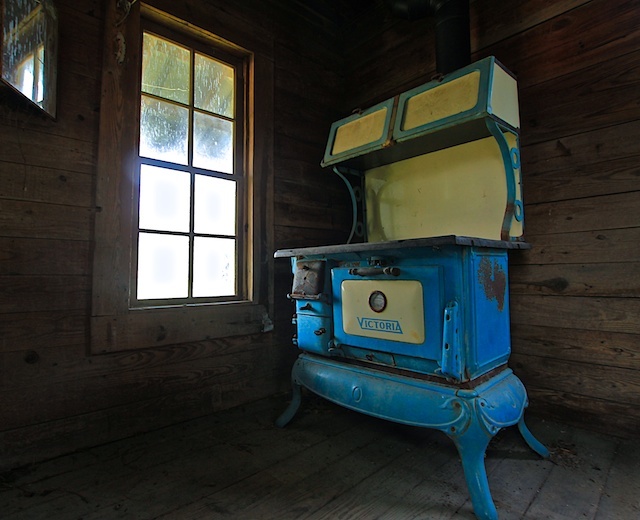 It helped feed people, this blue stove, and it helped to keep them warm. A family. Maybe a whole generation grew up around this stove. Nobody knew about climate change back then. Nobody could conceive of a hydrogen bomb. They didn't understand mass extinctions or Kalashnikov rifles. Iron and fire were good things, signs of progress, the ease of hardships, the end of suffering, answers to prayers. All the objects in this photograph - the window, the mirror the planks of the walls, all of these things were achieved because we learned how to control fire, to manage heat and flame. And what of the light that shines through this window to illuminate the stove? Fire. The light of a fire 93 million miles away. We owe the very fact that we see to fire. Our greatest evolutionary advancement, our greatest gift - vision, sight - the thing that makes what our brains think of possible. All the result of a very distant, and dying, flame. Skull-hunting is a pastime I took up in order to teach myself patience and humility. Patience because finding a skull is a hard thing to do. And humility because they're skulls - the remnants of the heads' of the dead. A skull is a fascinating and terrifying thing. By itself it is the very symbol of death, yet within one we can see, still, the features that once gave it life, that gave it awareness and voice - its eyes and teeth. 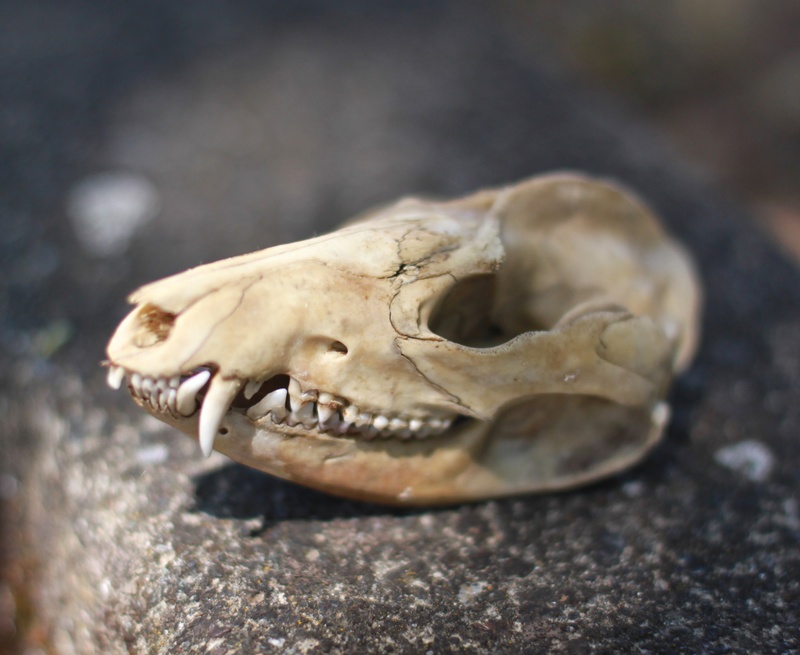 Because we associate a skull with death, we see death in bared teeth and eyes hollowed. When the flesh is stripped away we see the basic form of the animal below, we see what we are, a marvel of microscopic systems that assemble to create a form; a form that procreates form. Skulls are not easy to collect, unless you buy them. But that wouldn't be serendipitous, and then they wouldn't be gifts. A skull should be discovered, stumbled upon, won through effort and exertion. And the only way to find them is not to look. This was a fox. It's all that remains of him. It's sitting beside a grave in an old Catholic cemetery where it must have been for months without anyone having noticed it. It died here. I know this because I found it still attached to its spine, amid a cluster of other bones that were its ribs and limbs. So it died here, or was dragged here, and here it sat undisturbed until I happened along accidentally, because I was bored and wanted to go out and use my camera. I came to the cemetery to photograph the monuments of the dead and found this. The head is where it all happens. It is the home of thought and action. It is the one external part of our bodies we can't live without. There was a reason why, in times not so recently past, that power took the heads the powerless. To take a head is to utterly destroy, but more than that, it is to utterly defile. The head on the pike was a symbol of supremacy and a beacon of fear. The skull meant death, but it also means life. The skull is proof of the miracle of life, of intelligent life. The creature whose brain requires such protection is surely worth living, and passing on its crazy formula for a slightly altered duplicate of itself. To house eyes and guard brain, to receive and process the very smell of living, the various sounds of it, the vibrations life makes, all the images, memories, voices and songs that were once contained within, even the fox - what things it alone has seen and heard and tasted and smelled before it met it's end? The skull is a talisman that can tell no story, but all stories. Photography is ostensibly a means to discover the world around us. But the world around us, if we look closely, is a reflection of ourselves. Often, it is the unexpected discovery that leads us to a deeper understanding of who we are in the moment. Take for example this duck. I found it at Limantour Beach one morning sitting atop a dumpster. There was no one around, but there was a crow in a tree nearby watching me as I approached. 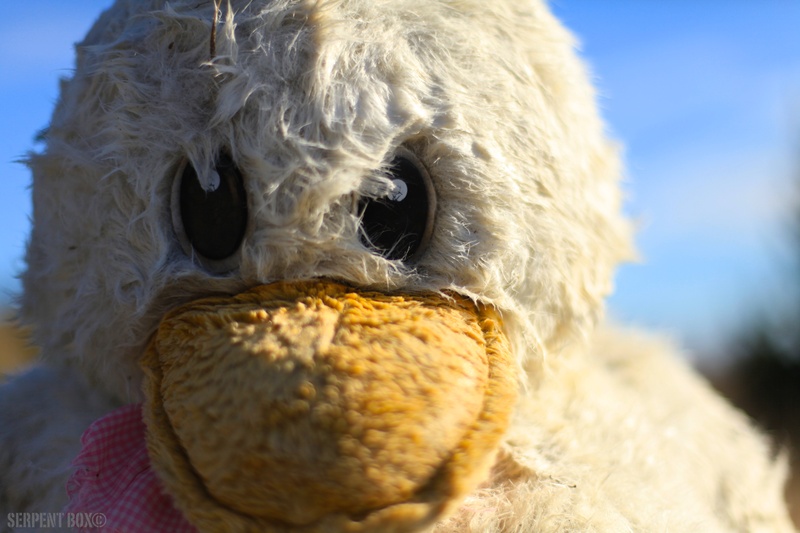 The duck was about the size of a child, slumped over and staring directly at me, as if waiting for my arrival. Upon closer inspection I found it to be saturated with water. It was likely found on the beach, washed up by the waves after having been tossed in the ocean. What I would have given to have been the one to find it there on the beach. But that was not my destiny. The duck was waiting for me where it was meant for me to see and it seemed that the crow was waiting too. He watched me take my photographs, curiously rubbing his beak back and forth across the branch he was sitting on in that strange way that crows do. So, here was one bird, real and living, watching my reaction to another, stuffed and perched on a trash receptacle where it was bound for some landfill. What was it thinking, this crow? Did it recognize the form of this effigy? Could it recognize that it was a likeness of something living? I believe that it could, and did. But at the time I was focused on the duck. How did it get here? What journey did it take? From some factory in a land far across oceans, fabricated by cheap labor, a wiry Chinese lad with a cigarette dangling from his mouth, and shipped back across the seas in a dark container aboard one of those behemoth ships of the Han-Sing line, bound for a carnival side show perhaps where it hung for months above some rigged game of chance, waiting amid the smoke and calliope, coveted by thousands of little girls before it was won one sultry evening by a rangy young man half-drunk on watered down PBR's yet still deadly with a fastball. How he carried it in triumph all that night, or maybe gave it to his girl, where hung beneath her skinny arm suffering her giggles and spilled beer, and then maybe sat atop her nightstand staring back at her through the dark of a thousand nights in some Velveteen dream that was never quite fulfilled. Of course he was named. Of course he was forgotten and abandoned and then tossed away, flung back into the ocean from which he came, the castaway duck riding the currents face down, buoyant but not as a duck should be, because of course he's not really a duck but only a facsimile fashioned out of polyester to appear duck-like to simpletons who are so easily deceived. So, although I took hundreds of photographs that day - photographs of trees and sand dunes and objects that were not representations, but true - this, this first photograph of the day was the most meaningful, the most lasting, the most surreal. I could have turned around and went home without taking another and called the day good. The duck and I, we had ourselves a little conversation. Me with my feeble words and my surrogate eye, and he with that knowing look in his eyes, a look that says, who's the fool now? He was on his way to the dump to rot, forgotten. By my turn would come soon enough. And what story would stand for me after I was gone?